Geez I remember a friend having this 12". We would turn the lights off and do somersaults down his hallway. In between spasms we always complained it was too short. Now is my chance! 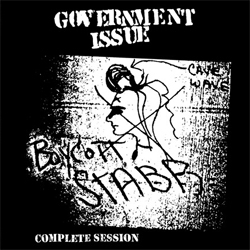 When Government Issue recorded Boycott Stabb in November 1982 they initially tracked 20 songs, including several older previously recorded songs. The band had been through a major line-up change and finally decided only to release only the newest songs. The outtakes have remained un-mixed and unreleased until now. Side A of this 12" LP features the original 'Boycott Stabb' songs and Side B features the outtakes.